Maya Khankhoje was thrilled to step on Israeli soil at the Tel Aviv airport on her way from one continent to another one. That was two years before the six-day war of 1967. Now she would be heartbroken. The “land of milk and honey” generally refers to the promised land of Jewish tradition. As a notion, it denotes a land of peace and plenty. In sharp contrast to this placid image is the reality of the “kingdom of olives and ash” where conflict has been raging for more than fifty years, causing untold suffering, penury and destruction. Ayelet Waldman and Michael Chabon, after more than a quarter of a century of hesitation, decided to go there to see for themselves and then report to the world at large. When they finally did go, they took with them a motley crew. Ayelet was born in Jerusalem but was primarily raised in the United States and Canada, the daughter of immigrants from Montréal. She lived and studied in Israel on and off over the years. For Michael, it was his first time in Israel. They were accompanied by twenty-four writers covering all continents except Antartica, of different ages and with eight mother tongues. Some of the writers identified as Christian, Muslim, Jewish and Hindu, while others claimed no religious affiliation whatsoever. You might recognize many of them: Lorraine Adams, Geraldine Brooks, Michael Chabon, Lars Saabye Christensen, Maylis de Kerangal, Anita Desai, Dave Eggers, Assaf Gavron, Arnon Grunberg, Helon Habila, Ala Hlehel, Fida Jiryis, Prochista Khakpour, Hari Kunzru, Rachel Kushner, Eimear McBride, Colum McCann, Eva Menasse, Emily Raboteau, Taiye Selasi, Raja Shehadeh, Madeleine Thien, Colm Toibin, Mario Vargas Llosa, Ayelet Waldman and Jacqueline Woodson. In Chabon’s words, they were able to have “a clear, visceral understanding of just what the occupation meant, of how it operated, and of the decades of Israeli strategic planning that had gone into creating the massive, often brutal, always dehumanizing military bureaucracy that oversees and controls it.” In his introduction to this collection of essays, Chabon categorically states that writers’ contributions were not edited or censored nor did anyone receive any payment for them. 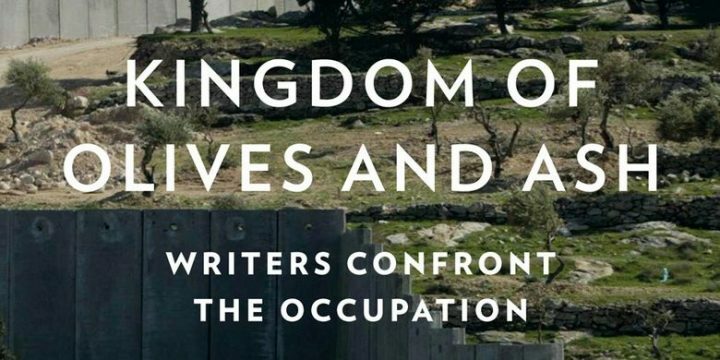 He also explains that “all royalties from the sales of Kingdom of Olives and Ash, after expenses, will be divided between two NGOs: Breaking the Silence and Youth Against Settlements. ♦ In Italo Calvino’s Invisible Cities, places are folded inside other places. Cities are not what they appear to be, but also what they are subjected to: memory, history, desire, forgetfulness, dream. […] In Israel and Palestine, I thought often of Calvino’s seen and unseen places, where the horizontal and vertical axes of history and place bend into the space-time of memory and desire. ♦ Then: I don’t know how many articles I wrote, lectures I gave, and manifestos I signed in those years opposing this caricatured vision of Israel, and affirming that it was a pluralistic and democratic society. ♦ We have arrived, we are told, at the village of Susiya. The dust stirred by our vehicle settles. We look around—and see nothing. Where is the village Susiya? Here is only dust, stone, rubble, and the white heat of the sun. It is difficult not to agree with Chabon.